In a remote community in Western Australia, 11 year-old Dylan is coming to terms with the recent death of his mother, and has to look after himself whilst his father (Sam Worthington) is overcome with grief. 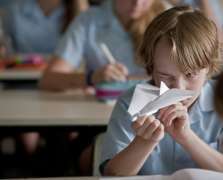 At school one day, he’s introduced to the art of creating paper planes and surprises everyone with his first record-busting attempt. 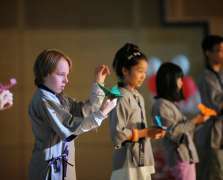 Taking part in the national finals, he qualifies for the World Paper Plane Championships, in Tokyo. Trying to raise the funds necessary for this once-in-a-lifetime experience, Dylan is helped by his school friends, the neighbours and his charmingly unconventional grandfather. But will Dylan’s success help rebuild his relationship with his father, and can his small-town creations really lift a world title? Join us after the film to celebrate the launch of the festival! We’ll have cake, balloons and lots of fun activities. Explore Hideyuki Katsumata’s dreamlike exhibition, write a film review and line up in our gallery for a unique competition to see how far your paper plane can fly, just like in the movie! Make sure to sign up by 18:00 to enter the competition. Everyone who comes along to Paper Planes is invited! 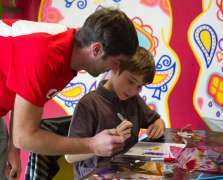 All Ages (children under 8 accompanied by adult).